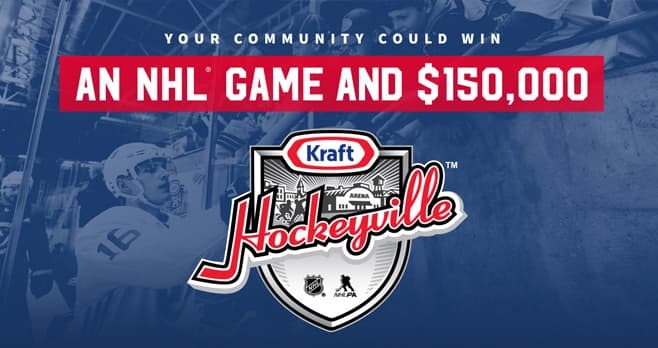 Nominate your arena at krafthockeyville.com and be crowned Kraft Hockeyville USA 2019. Your community could win an NHL Game and $150,000. The Kraft Hockeyville USA 2019 is open only to legal residents of the 50 United States and D.C., 13 years old or older as of the time of entry, participation in Rally Actions or vote. The Sweepstakes begins on January 1, 2019 at 7:00 a.m and ends on March 2, 2019 at 11:59 p.m. ET. ET. Limit one (1) approved Story Submission per person per Rink. The grand prize consists of $150,000 (paid via check) in Rink upgrades for the Grand Prize winning Rink, the opportunity to host the Game that will be played in that Rink, and the “Kraft Hockeyville USA 2019” title and trophy. Visit www.krafthockeyville.com to enter and see Official Rules for details.